Just over a week ago, at the Chardon High School near Cleveland, Ohio, a seventeen-year-old youth opened fire on fellow students: Six were wounded and three have died. A teacher said it was important to get the rest of the students back to school to “show that terror and evil do not win out.” Such things keep happening, and people make brave, encouraging, and ridiculous statements. So there’s a lot to talk about in this striking but frustrating film, one that’s good enough in some respects to amount to a serious failure. It comes from a novel, by Lionel Shriver (who was born Mary Anne Shriver), and it is scripted and directed by Lynne Ramsay, whose last feature film in 2002 was the remarkable Morvern Callar, in which Samantha Morton played a young woman who claims to be the author of a novel written by her boyfriend who has just killed himself. The novel of We Need to Talk About Kevin was set in Britain, but the movie has been transposed to the American provinces—it was filmed in Connecticut, but no place is named. Kevin is the sixteen-year-old son of Eva and Franklin (John C. Reilly), and one day he goes to school with his weapon of choice and kills an unnamed number of kids. Lionel Shriver’s novel was composed as a series of letters from Eva to Franklin after the massacre, and after they have become estranged. The film has a different structure, which I won’t spoil, but it has the effect of the novel in that the sensibility, the grief, and the near-madness of the mother is its core. 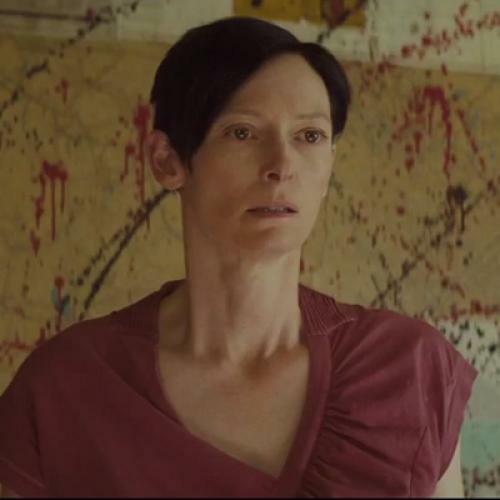 Eva is played by Tilda Swinton, who is also one of 21 producers on the project. I should add that I have had a modest friendship with Swinton over the years, and I offer that not just as an admission of possible bias, but as a way of going to one of the great problems with the movie. Tilda Swinton has to be counted as a late bloomer: She is 51 now, and this is the best performance she has delivered yet, utterly self-effacing in that there is no attempt to enlist movie glamour; she is committed to the emotional depths of a ghastly experience, and consistently intelligent. But that’s where the difficulty starts. You don’t have to know Swinton’s background to grasp her quality of mind and spirit. No matter how she lets herself look on screen or in still photographs, a blazing independence shines forth. Of course, she is not “ordinary” in her looks: She is tall, her hair is red, gold, or merely luminous, and she can easily seem like a pale icon from dream or fairy-tale (as well as a fashionista). But, as here, she is willing to look wretched and morally exhausted. Swinton has an amiable nature, but she is fierce, forthright, and pledged to her own intelligence. This brings up an awkward and delicate point: She would not marry, let alone live with John C. Reilly for more than a weekend. This is not to disparage Reilly: He acts a lot and he has often been touching, as in several films by Paul Thomas Anderson (Boogie Nights and Magnolia). He has also done a lot of drab, thankless work. But there is a gulf of sympathy and kinship between him and Swinton so marked that it seems intended and designed. So, inevitably, what happens with Kevin seems to derive in part from the incompatibility of his parents. Eva knows there is something wrong with Kevin from early on, while Franklin is inclined to believe he’s just a kid. That is assisted by Kevin showing different sides of himself to his mother and father, but that shift is so blatant and calculated it only makes Franklin seem more of an idiot, and Kevin closer to deliberate evil. You want to know about Kevin? I’ll give you the highlights. He cries steadily as an infant; he fouls himself long after he should be toilet-trained; he defies his mother’s efforts to teach him or love him; he will have a young sister and he … well, wait and see. Above all, Kevin watches the camera and himself being watched by his mother with a gaze of evil. Ezra Miller is very frightening as Kevin, and I’m sure this is the way he was cast and directed, but having had conversations with Tilda Swinton, I believe that this woman would despair of the dense, sleep-walking Franklin and get the boy to a doctor, a therapist, a child services unit, or an exorcist as fast as possible, and not take no or perhaps for an answer. No such thing happens, not even after the malice in Kevin has been made quite clear. This reaches such a point that what seems like an attempt to deal with a real problem in child development topples over into being a horror film. Kevin gets far too close to The Bad Seed or Damien in The Omen for comfort and plausibility. Throw in these errors of omission and commission: The family lives in an expensive house, but we never see what the father does for a living. Then there is Eva’s life as the author of adventurous travel books—I don’t think this is her dream (though there is a hallucinatory opening sequence that could be one of those trips or a throwback to her hippy days). But if she goes away on long trips, that might be something that disturbs Kevin. It could be an issue that his school has noted and commented on. Except that, until the end, until the massacre (which is not shown), we never see Kevin at school, with friends or enemies. In fact, the boy (played as toddler, infant and teenager, by three actors) is locked into the torturous relationship with his mother. So she feels guilty and she is victimized by townspeople after the massacre; it becomes a film about her scattered mind. That produces wonders from Swinton, but it ignores the plea in the title. What about Kevin? Why is he like this? Why does he do what he does? It can’t be because he fell in love with Robin Hood as a little boy. It’s not because he was neglected. Is he mad? Is he evil? Are those answers of any practical use? Kevin deserves so much more attention—indeed, he deserves being played by Tilda Swinton.